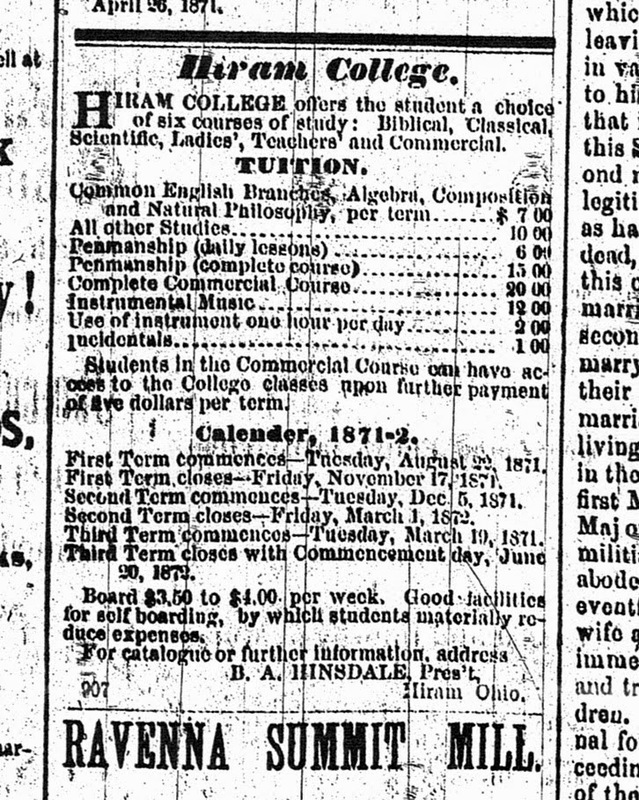 Hiram College offers the student a choice of six courses of study: Biblical, Classical, Scientific, Ladies’, Teachers’ and Commercial. Students in the Commercial Course can have access to the College classes upon further payment of five dollars per term. Board $3.50 to $4.00 per week. Good facilities for self boarding, by which students materially reduce expenses. I did a quick check using the Measuring Worth website, and found $10 had the same relative purchasing power in 1872 as $197 does today. I have a hunch the incoming Class of 2018 would find that a pretty attractive course fee. It’s interesting to see the curriculum offerings, too. I wonder what classes were offered in the Ladies’ course of study? The fact that Penmanship was listed separately in this little advertisement suggests it was popular. With the decline of teaching cursive handwriting in elementary school, will we eventually see Penmanship on college class schedules again? 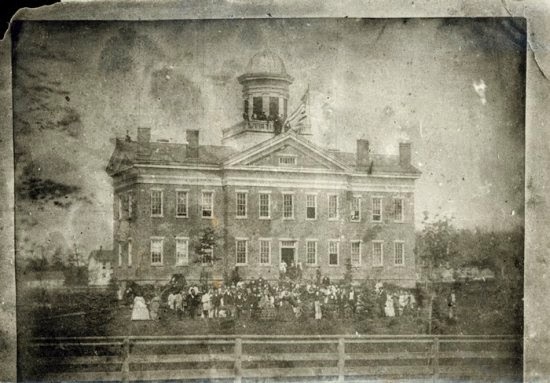 Hiram College was founded as the Western Reserve Eclectic Institute in 1850, and has a proud history of higher education. My father-in-law and at least three of his ancestors attended Hiram at one time or another. He also has a family connection by marriage to one of its founders. So the accidental discovery of this little ad might lead me into a little more investigation. That’s the fun thing about newspaper research. You never know what you might find, cranking through the microfilm on a summer afternoon. Yeah, Shelley, I'd say $197 would be a real bargain for a year of college now! My daughter happens to attend the same college I graduated from. When I was going there, a year's course of studies ran about $4000 for on-campus students. Now, just the tuition and fees top $40,000--a painful jump over the years! With three kids going through college, I know just what you mean, Jacqi! Thanks for reading.